Yesterday came news via Variety that actor Sean Penn would be taking some time off from acting to work on his marriage with actress Robin Wright Penn. 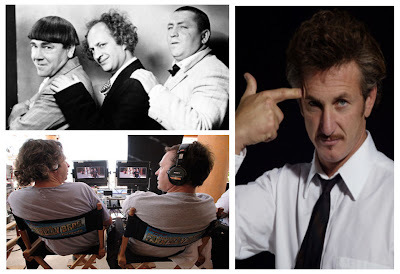 Penn's withdrawl from his obligations left the film's "Cartel" and "The Three Stooges" with an important decision to either re-cast or hold production for the Academy Award winner. With "Cartel" adding another actor seems easy enough (and that is the direction the studio is taking), but when it comes to the 'Stooges', finding another actor like Penn for Larry seems highly unlikely. The Three Stooges are one of those iconic figures that fans are absolutely rabbid about. Like many, prior to any casting news I thought a Three Stooges film would never work. Then casting news began to leak out and the casting's were pretty remarkable. I mean Benecio Del Toro as Moe, Jim Carrey putting on 4olbs to play Curly and then the icing on the cake, Sean Penn as Larry. The Farrelly brothers had struck casting gold and "The Three Stooges" could actually prove to be a faithful and worthy adaptation of the three knucklehead's we love. Now we have the current news of Penn dropping out for at least a year to work on his family and "The Three Stooges" doesn't sound golden. MGM could move forward with the film without Penn, but I doubt they would find anyone of note close to Penn to fill Larry's shoes. MGM hasn't committed to anything yet either, they may just wait it out for Penn, which would seem like the best option for the film to actually prove profitable. Sean Penn deserves the time to save his marriage or simply time away from Hollywood. Surely if, "The Three Stooges" has waited this long, it could wait another year or so.